Philippine maritime schools have agreed to implement the ITF HIV module for seafarers as part of an effort to educate their cadets about the sexually transmitted disease. 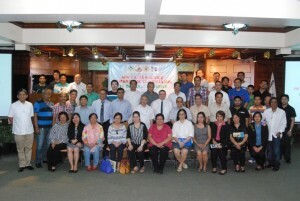 AMOSUP and ITF, which recently met members of Philippine Association of Maritime Institutions (PAMI), also listened to a number of suggestions to enforce the module in their curriculums. They include measures that range from monitoring the effectiveness of the HIV training to retaining afflicted students in schools. The unions expect the developments to have 80 percent of all marine cadets graduating from the Philippines will have received in-depth training in HIV and other sexually transmitted diseases. “We are trying to find ways and means to spread awareness on HIV, focusing on education and letting our students learn the importance of prevention,” said VAdm Eduardo Santos (AFP, ret), AMOSUP EVP who facilitated the meeting last 02 July. A proposal has been forwarded to include the module as a separate subject in the school curriculum. “If the institution finds that there’s a need to offer it as a required course, CHED is open to support the course as a requirement,” according to a participant. It means that before they graduate and go on board ship, all cadets will now have extensive information on HIV and other sexually transmitted infections, as well as their right, should they become positive. The inclusion of the ITF module on the prevention of HIV/AIDS will be a groundbreaking development in maritime cadet training in the Asia Pacific region, as part of the federation’s global drive to build knowledge in all the major seafarer supply countries. The planned implementation of the programme follows a successful pilot with the AMOSUP-managed Maritime Academy of Asia and the Pacific, which launched the module early this year. PAMI members will work with AMOSUP and ITF, who will provide technical support in incorporating a comprehensive HIV/AIDS and STI module in their curriculums. PAMI, which represents 80 of the country’s marine academies, expects the module to be introduced in all the academies.